This option enables you to set your preferences in terms of the theme, highlight color, date format, student screen display, password resetting and student search view options. Go to Users >> Preferences to access this page. From here you can change the Theme Color, Highlight Color, Date Format and check/uncheck student display options as per requirement and save it. The Theme color will change the openSIS interface color as per the selection. The Highlight color will change the cursor selection preview to the selected colors in the options. For instance, the impact of highlight color is visible in sections like Users >> Setup >> Profiles; now move the cursor over the profile list and the selected highlight color will be apparent in the user’s sight. By checking “Disable login alerts”, it will disable all the login alerts like Missing Attendance, Rollover Required etc. that appears in the home screen page. By checking “Display data using hidden fields”, all the field boxes remain hidden after the data input. For a better understanding, look into the images below. The above image demonstrates a display view after that option is checked whereas the image below demonstrates a display view when that option is left unchecked. Hence, “Display data using hidden fields” option enables the data field to be hidden or appear as the user prefers for their display view. 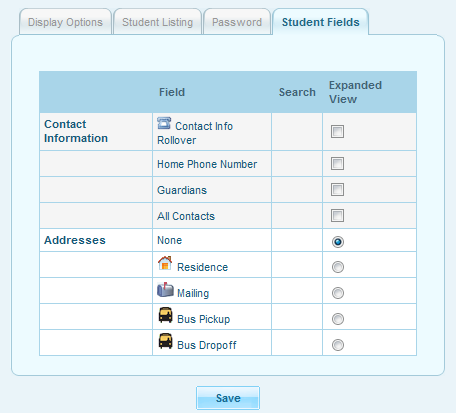 This section provides various options for the student's listing in the system. In Student Name, the user may choose either common name or the given name to appear in the student lists. In Student Sorting, the user may choose to sort students by either their name only or grade level and name. In File Export Type, the user may choose either Tab-Delimited (Excel) view or CSV (Openoffice) view. It depends on the user’s individual preference. File export option is mostly available in all the listing pages like a student list. You will find a small excel logo above the student list like it appears in the screenshot below. Display student search screen option enables the Student Search Screen to be viewed. Hence, it is preferably marked checked. If this option is marked checked, then two more options appear beneath it such as ‘Group by family by default’ and ‘Search all schools by default’ which are included in the student search screen. By checking "Group by Family by default" option, Group by Family option will always be marked checked in the student search screen by default and when this option is checked, only the students associated with their parents will appear in the student listing. By checking "Search all schools by default" option, Search all Schools option will always be marked checked in the Student Search screen by default and when this option is checked, the search will take place from the list of all the students amongst all the schools in a multi-school database and hence, the list of students will appear. To change the Password you will have to click on this Password Tab under Preferences. Here you need to give your current password, then the new password and verify new password and click on Save. Your password will be changed. Select the Student Fields tab. Now you can add other fields in the student search screen page by checking the checkboxes under Search and by checking the checkboxes under Expanded View, you can increase the number of information about a student in Expanded View option that is enabled in the student listing section.